Christopheria is a genus with but a single species, C. xantha. For many years this species was thought to belong in Episica, and in fact clearly resembles some members of that genus. 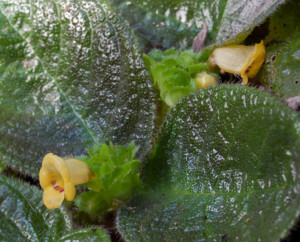 Leeuwenberg (1980) in his description of Episcia xantha comments that this is the only known species of Episcia with yellow flowers, but states that it is “closely allied to E. cupreata (Hook.) Hanst. by the habit, shape and size of the flowers”. However, recent genetic analysis reported by J. F. Smith and J. L. Clark have shown that it is only very distantly related to Episcia, and has no relatives close enough to warrant inclusion in another genus. Christopheria is known from forests in French Guiana and Guyana, between 50–500 m.